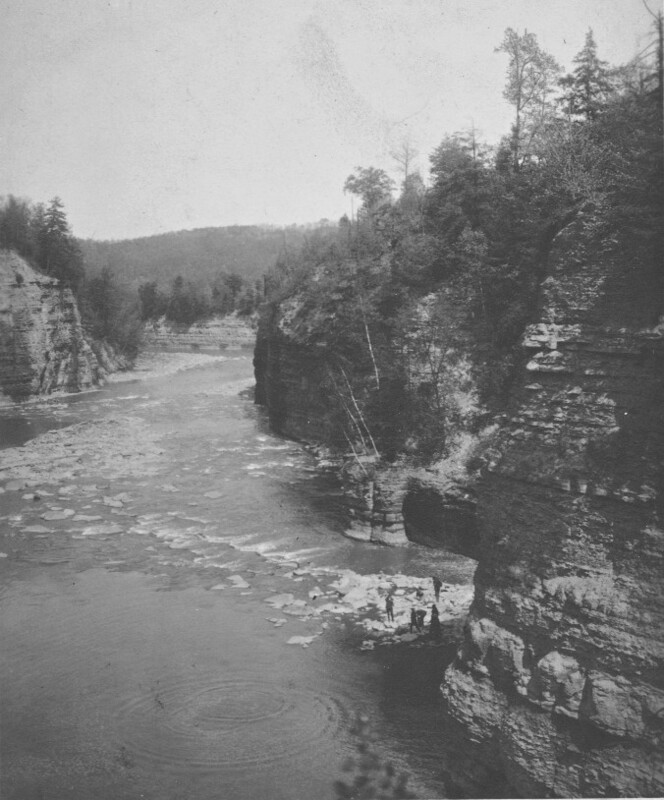 This photograph was taken from Table Rock near the Lower Falls. Sugar Loaf Rock is to the right and down the river, beyond the distant bend, would be Lee's Landing and Big Bend. It was probably taken in the late 19th century, though there is a bit of 20th century history associated with the image as you will see below. What makes this image interesting is the group of tourists and their dog on the rocks below Sugar Loaf. It is not clear how they reach the east bank of river - remember that the footbridge would not be built until the 1930s. Perhaps they had hiked down along the Pennsy tracks from the Portage Bridge, and then followed the old road down toward Big Bend. Quite an achievement given the clothing of the time, as was climbing down to bank to the rocks where they stand. The photographer must have noticed that a two of the group were picking up rocks and waited until two stones were tossed into the pool below Table Rock to take the photograph. The result was a moment frozen in time on what was then Mr. Letchworth's Glen Iris Estate. See the enlarged picture below and the back label for more information. 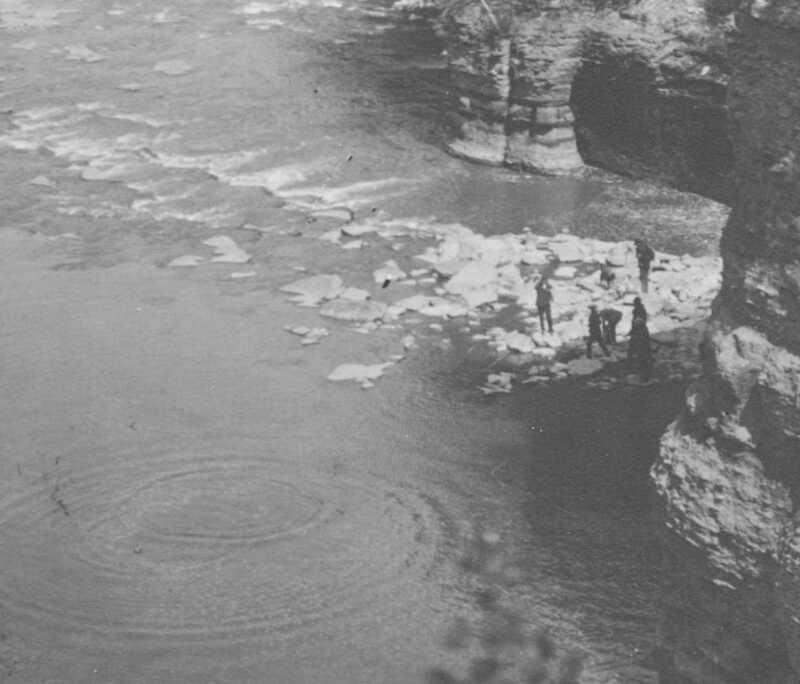 "Looking down River from Table Rock Lower Falls note fishermen at foot of Pilgram (sic) Rock Letchworth Park John R. Lingenfelter supt." Several interesting details can be found from this label. First, the label was written perhaps thirty years after the image was taken. 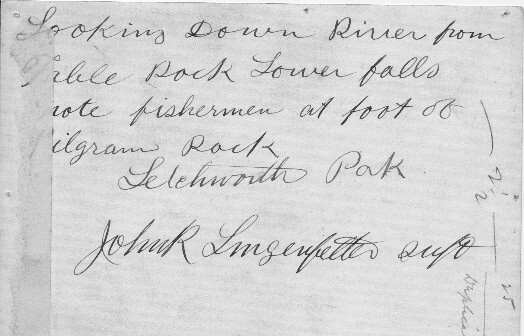 Letchworth Park was established in 1907, but John Lingenfelter did not come to the new Park until after World War I. How the Park Superintendent came to label an old photograph is not known, but it is possible, from other marks visible on the back, that copies were being made an old negative. Also interesting is that Mr. Lingenfelter called Sugar Loaf "Pilgram (Pilgrim) Rock." The feature has also been called "Cathedral Rock", but "Pilgrim Rock" is a new one.